Every time Christmas season rolls around, I start to feel bad about not having any ideas for a good anime Christmas post. So I’m kind of glad I was able to halfway write something related to both anime and Christmas this year, even if it might be a little bit of a stretch. Gundam, Toradora!, Christmas, and family themes aren’t necessarily the most obvious bedfellows, but I think I mostly made it work. AniwordsAniwords, Family, Gundam Tekketsu, The Christmas Episode, Toradora! Toradora was surprisingly good. The Gundam Orphans just didn’t work for me. Not enough focus to the story and the character of Kudelia just didn’t work enough to actually provide the conflict that drives the story. Though I think you’ll be happy to hear my husband and I have started watching another anime about family: Kyousougiga. Toradora!‘s one of my favs, and while I don’t have quite the problems with Gundam that you have, I do agree that it doesn’t have a ton of forward momentum. And yes!!!! Kyousougiga is amazing! I hope you guys enjoy it! 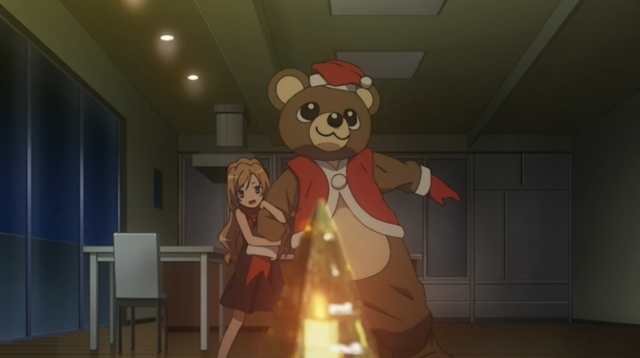 Aww, the Toradora Christmas arc was great all around, and the scene you screencapped was the highlight. Good memories. Family themed anime makes me remember a show I randomly watched precisely because family was in the name and I liked the character designs: Kyouran Kazoku Nikki. Family values are front and centre in that show, but… well… It’s impossible to explain the madness. The concept? A thousand years ago a dangerous monster was defeated, but the monster vowed that in a thousand years’ time his descendant will destroy the world. Japan’s solution to the problem? If we collect all the beings with that monster’s DNA and give them a happy family life they won’t want to destroy the world. So a government official “marries” a cat girl, and they adopt several children, which include a talking lion, a telepathic jelly fish, and a biological weapon. It’s not as sane as it sounds. This time last year I was in the midst of writing up an episode of Toradora! a day; it was a good time. That sounds like… an extremely anime anime. Perhaps I’ll need to give it a try heheh.